In my past life, I owned a catering business where people often asked me how I learned to cook. My father, a cattle rancher from the central coast of California, was one of the originators of the “Santa Maria-style BBQ” back in the 1950s. He was fortunate to be able to combine his love of food with his gift for gab; weekends often included invitations to dinner for friends and neighbors. Dad would barbeque his famous beef tri-tips and mother would put us kids to work in the kitchen, making salads, beans and casseroles. It was the start of my cooking lessons. Years later, I started catering on my own and opened my business, Divine Bovine. I custom-catered small cocktail parties, fancy galas, annual dinners, intimate dinners for two and fundraising events for 750 attendees. I catered lunch for Al Gore, then Vice President of the United States; other congressmen and political hopefuls; Steve Young, quarterback for the San Francisco 49ers; and a very close friend of Julia Child. I gave cooking lessons to children and taught cooking classes for adults, all with standing room only. Rarely did I serve the same entrée twice. Three file cabinets crammed with recipes and 237 cookbooks later, I closed my catering business, married the love of my life and moved to New Mexico. I swore I would never work nights, weekends or holidays again. Little did I know how that would change the minute I gave my husband a Bernese Mountain Dog puppy for his 50th birthday. Named Tiamo, the newest member of our family had us wrapped around every one of her paws within five minutes of bringing her home. Every day was an adventure for Tiamo: there were books to chew, magazines to rip up and wooden spoons to carry from room to room. Friends would fight over who held Tiamo’s leash on walks. Neighborhood kids would randomly drop by to pet her. She was the darling of the community and our hearts. Tiamo knew not to beg for table scraps, but she was quick to lick up any tasty tidbit that fell to the floor. We learned Tiamo had a keen ability to counter-surf, quickly and quietly. Cartons of cream would go missing, only to be found empty in another room. Cookies cooling on racks would be one fewer of a dozen. Licked-clean butter plates would be discovered under couch pillows. Then she was busted — caught in the act with one paw reaching for the goods! At two in the morning, we were awakened by a big crash; Tiamo had crawled up on the kitchen table to lick up crumbs. 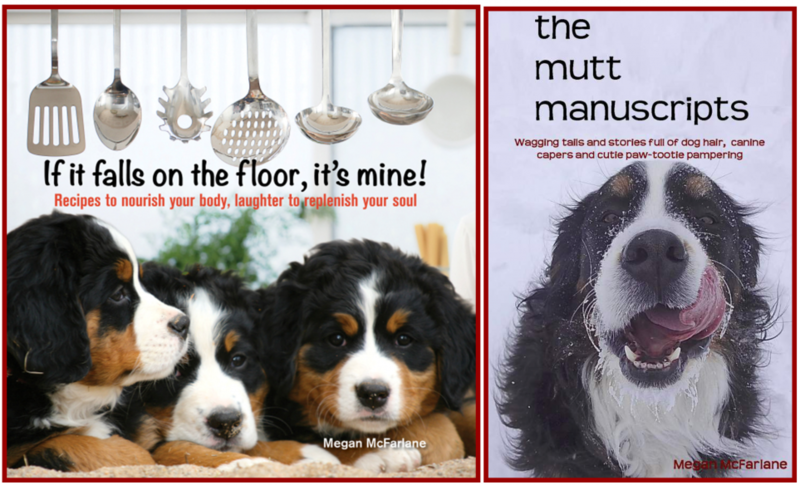 My love of cooking for family, friends, and my enjoyment of Tiamo’s humorous antics while sniffing for a fallen crumb has produced a cookbook designed to bring compliments to the chef and smiles from the cook … along with a tasty morsel for your dog. Yes, cooking and dogs do go together. A stray dog hair never hurt anyone! Are our dogs taught by the kids? Or is it the other way around, the kids learn from our crafty canines?